They had planned to block the France against, inter alia, the increase of taxes on fuel. They have managed to mobilize. The "yellow vests" were indeed present as early as 6 o'clock in the morning on Saturday on the roads and other strategic points across the country. This Sunday, several activities and events were ongoing, including on the motorway network. Here are the numbers to remember: 2034 gatherings, 287.710 protesters, 1 person killed, 409 wounded, including 14 serious, 282 arrests. "28 police officers, gendarmes, police, bikers, firefighters were injured, and for some way serious," said the Interior minister Christophe Castaner. on Sunday morning, the minister of the Interior, Christophe Castaner, reported 287.710 protesters gathered Saturday across the country on 2034 sites. Only have been blocked from access points, but no strategic focus, according to the ministry. Christophe Castaner has also reported a change in profile of the protesters in the evening, when clashes broke out in some cities in France. The protesters "good kids" are being transformed "with the arrival of goons," according to a part of the national gendarmerie. Molotov cocktails have been thrown on the forces of the order on the A4. "Sword slash" were used at the Meeting. "This night has been rough. (...) There has been assaults, fights, stabbings," confirmed Christophe Castaner. "There have been fights between yellow vests. There has been a lot of alcohol in certain places, and it caused these behaviors idiots that can push the violence, and it becomes unacceptable," lamented the minister of the Interior. In Troyes, a hundred people are brought into the prefecture in which they "have committed acts of degradation" before redirect to the town hall, which has required the intervention of the forces of law and order, said the Director general of the national police. Similar movements have been observed at Laval, in the Mayenne, as well as in Quimper, in the Finistère, where a water cannon was used to disperse the protesters. At this point, the police have arrested 282 people, of which 73 during the night, which has given rise to 157 police custody . An event not declared in Savoie, Pont-de-Manduel, has turned a drama. A protester was killed at a dam filtering by a driver who panicked, was reversed. other incidents of this kind have punctuated the morning. A person is thus to be found in absolute emergency at Arras, after having been reversed. To Hazebrouck, where a van has forced a barrage of protesters, two people were injured. And according to the prefecture of the Alpes-Maritimes, a motorist has attempted to Grasse forcing a crash at a roundabout and injured the national police, "fortunately, very slightly". In total, according to figures from the department, 409 people were injured, including 14 seriously. 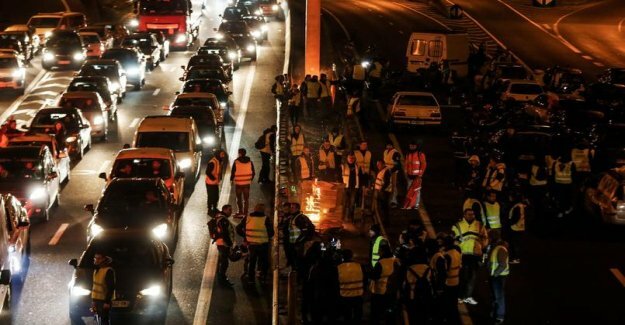 at dawn, protesters, dressed in their yellow vests, were on the paris ring road, at Porte d'auteuil and Porte Maillot, where they were greeted by the forces of law and order. According to our reporter Angélique Négroni, this place, the atmosphere was good child. But blocked by the police, the demonstrators did not know too where to go. Finally, the group was broken up by the CRS that have literally strangled the movement. Stuck on the sidewalk, some protestors have chosen to remove their yellow vests to be able to again be free of their movements. "All this for that", lamented Cedric, inhabitant of Épernon in the Eure-et-Loire, who came specially for the occasion... note that despite slowdowns, the traffic remained fluid throughout the day on Saturday, according to Sytadin. The VTC, very mobilized against the increase in fuel prices, are also massaged in Bercy, near the ministry of Finance. Several CRS were on-site. The yellow vests then went on the Champs-Élysées, where skirmishes broke out. The protesters then took the direction of the Elysée. But the area around the presidential palace were cordoned off by the forces of law and order. They had to stop a few metres away. Christophe Castaner has swept this Sunday criticism about the lack of security around the Palace. According to him, the area around the Elysee was classic, "there has been a little runaway" (from the observer) when the protesters arrived at a few tens of meters of the palace of the Elysée, "but the device was justified". • * * many protesters in the region. according To our journalist at Nice, Vincent-Xavier Morvan, at 13h on Saturday, the prefecture of the Var accounted for 6 points of blocking and 14 events in the department, involving 6,000 people and 2,300 vehicles. In the Loir-et-Cher, at the roundabout of Noyers sur Cher, 200 "yellow vests" was conducting an operation of filtering, found our journalist Jordan Pouille. In Laval, the mobilization of the yellow vests gathered at mid-day Saturday more people than planned. They were 2100 people, including 1800 in a procession of 600 cars and 200 motorcycles around the ring road of the prefecture of Mayenne, our reporter on the spot, Eric De la Chesnais. The prefecture was counting on 1000 to 1500 people. It is one of the most important gatherings of recent years. The tractors had ban to join the movement. Farmers have defied the order of their unions and came forward to express their anger against rising taxes of all kinds. access to airports was part of the targets listed in the "yellow vests". Saturday morning, disturbances were reported at the airport of Toulouse-Blagnac airport, at the level of the south access. The side of Paris, no problem to go to catch his plane. According to drivers of taxis and the VTC, interviewed at charles de gaulle airport by our journalist Anne Sollier, the circulation was done without problem in both directions in order to access and depart the airport. The chairman of Standing the France, Nicolas Dupont-Aignan, was on franceinfo on Saturday morning to bring back his support for the protesters. "Condemning people to not be able to circulate, it is the government that is blocking the country,"-he said. "I wish we had a government that let him hear. It stifles those who are working, it affects the money to the wrong causes. I ask the government to change otherwise it will end in revolution", he warned.
" READ ALSO - "yellow Vests": Dupont-Aignan, "it is the government that blocks the country"
Since the Nice, Eric Ciotti, mp-LR of the Alpes-Maritimes, visited Saturday in front of the hotel tax Nice. "Symbolically, I wrote to the president of the Republic, Emmanuel Macron, to ask him to stop with this tax burden that it imposes a bit more every day to the French, to stop this madness of increasing taxes on fuel", he launched at the microphone of Europe 1. The president of the Republicans, Laurent Wauquiez, for his part, made in le Puy-en-Velay to show...without the yellow jacket. "Today there are people who are knocked out of taxes and that does not come out. But more than that, these are people who have the impression of not being respected and not listened to", he lamented. • The CGT supports a movement "legitimate". Philippe Martinez, general secretary of the CGT, called on the government to increase the Minimum wage to calm the grumbling "legitimate" yellow vests, reiterating his opposition to participate in the mobilization of the day because of the presence of the extreme right.